Of all the day's performers — which included Ludacris, Akon, Chris Brown, Ne-Yo, Ciara, Young Jeezy and Mims — it was Diddy that rocked the stage the longest, complete with pyrotechnics and guest spots from T.I., Young Dro, Keyshia Cole, Elephant Man and Yung Joc (See Photos). Former Bad Boys the LOX rocked it the hardest taking turns guesting throughout the day, with Jadakiss hitting the stage three times, Styles P twice and all three uniting during Diddy's performance. But it was definitely Lil' Kim — looking slim in a revealing red leather outfit — who surprised the packed Giants Stadium crowd the most, simply by rocking the stage at all. The Queen Bee reunited with Diddy and the LOX for her first public performance since being released from federal prison last year. Diddy, ever the showman, marked the special occasion. "Hold up, hold up, we not done yet," Diddy told the audience after he'd already brought out the LOX midway through "It's All About the Benjamins." "I think we got one person missing," he continued, cutting the music off. "Brooklyn — stand up! Make some noise for my girl, Queen Bee!" The pint-sized MC stared at the crowd down from an elevated platform before busting into her trademark "Benjamins" verse, to roaring approval. Still plenty of artists, including Swizz Beatz, brought the heat. Swizz, who recently was hospitalized for meningitis, rolled onstage in a wheelchair to show fans his dedication. "I'm sick as a motherf-----, but that ain't keeping me from coming to Summer Jam," he said, tearing off his hospital gown. He ran through a string of his production work, from Styles P's "Good Times" to Cassidy's "I'm a Hustla" to Juvenile's "Bottoms Up," for which Swizz brought out estranged Ruff Ryder Drag-On. "I'm the best!" Swizz yelled when Kanye West interrupted his set. R&B heartthrob Chris Brown also pulled off a few surprises. The Virginia native first wowed the crowd with his electrifying dance moves — scorching through "Gimme That" and "Run It!" — before pulling out a "Thriller"-esque leather jacket and a sequined glove to pay homage to Michael Jackson. Brown got down to "Billie Jean" before belting out Jackson's classic "Rock With You." 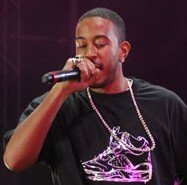 Juelz Santana and Lil Wayne later joined him on stage, each spitting his verse to the remix to Brown's "Poppin'." Weezy then took over from there. The New Orleans rapper went into his guest verse on Fat Joe's "Make It Rain," bringing out the Bronx bomber. Then Wayne spit a crowd-pleasing freestyle. "So many yellow diamonds/ Look like a fridge of Coronas [beer bottles]," he rapped. Mims, T-Pain and Ciara opened the festivities before the downpour set in. Ciara, dressed all in white, channeled Aaliyah during her set, gyrating while singing "Promise" and "Like a Boy." Ne-Yo, Fabolous, and Young Jeezy were the first to brave the wet weather. The Def Jam trio went from hit to hit, introducing each other — Ne-Yo brought out Fab for their current collabo, "Make Me Better" — before the singer stepped and the Brooklyn rapper introduced Jeezy and dove into "Diamonds." Akon rallied the troops for DJ Khaled's "We Taking Over" — bringing out Khaled, T.I., Wayne, Baby, Fat Joe and Rick Ross — as did Ludacris, who brought along his DTP fam, including Bobby Valentino. But it was Diddy who livened up the crowd, as thousands braved the rain and stuck it out until the end. "This is the biggest Summer Jam in the world!" Diddy shouted before making way for show-closer Rich Boy. "We love ya'll!" RAPPER 50 CENT & CIARA TOGETHER?